Comet 21P/Giacobini-Zinner is now visible with binoculars and telescopes. An even more spectacular naked-eye comet will follow in December. A bright-green comet is making an appearance in the night sky this month. Comet 21P/Giacobini-Zinner is now visible with binoculars and telescopes. Meanwhile, an even brighter comet is heading our way and will become visible to the naked eye in December. Comet 21P/Giacobini-Zinner, or simply "21P," will make its closest approach to Earth on Sept. 10 as it makes its way around the sun. A good pair of binoculars or a small telescope is needed to spot this bright-green comet, but the next comet, 46P/Wirtanen, will be bright enough to see with the naked eye in December. Before our planet plows through Comet 21P's debris, skywatchers can watch the comet as it slowly approaches the sun this week. 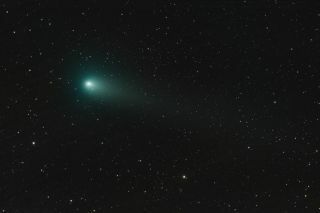 The bright-green comet "is expected to reach a visual magnitude of 6.5 to 7," according to the skywatching website EarthSky.org. "That means it will not be visible to the eye … but nearly." To spot Comet 21P at its brightest, point your gaze eastward to the modern constellation Auriga — home of Capella, the "Goat Star" — after midnight and before dawn. The comet will officially reach perihelion, or its closest point to the sun, around 2:40 a.m. EDT (0640 GMT) on Sept. 10. You can still spot the comet for several nights before and after this close approach, but how long it will stay in sight depends on how powerful your skywatching equipment is. To pinpoint Comet 21P's exact coordinates when observed from any given location or time, check out NASA's ephemeris calculator. If you don't get a chance to check out Comet 21P or don't have access to the binoculars or telescopes you need to see it, don't fret. Another comet encounter is right around the corner, and this time, you won't need anything but your own eyes to see it in the night sky (provided that you have good vision or sport corrective eyewear). On Dec. 13, Comet 46P/Wirtanen will make its closest approach to the sun, and it will be visible just after dusk, according to In-The-Sky.org. The periodic comet, which orbits the sun once every 5.4 years, was discovered in 1948. Its last close approach to Earth was in 2013, when it was 564 million miles (907 million kilometers) from Earth. While it was "not really an awe-inspiring sight" last time, this year Wirtanen will come much closer, Joe Rao, Space.com skywatching columnist and FiOS 1 News meteorologist, told Space.com. When it swings by again on Dec. 16, Comet 46P will be only 7.3 million miles (11.7 million km) away. Comet 46P/Wirtanen is "one of these little diddly comets" and tends to be visible only with a good telescope or a good pair of binoculars, Rao said. But this year, "it's going to be so much brighter than it usually is," he added. "It will become as bright as third magnitude, which is about as bright as the faintest star in the Big Dipper. So, if you know where to look in the sky, it will be against the winter constellations of Taurus the bull, near the Pleiades and Hyades star clusters." Comet 46P/Wirtanen will be closest to Earth on Dec. 16, 2018. Look for it above the eastern horizon after dusk all month long! It will be bright enough to see with the naked eye, and will look even more spectacular with binoculars and telescopes. To track Comet 46P/Wirtanen and figure out its coordinates, check NASA's ephemeris tool for 46P. Editor's note: If you capture an amazing photo of Comet 21P/Giacobini Zinner or Comet 46P/Wirtanen and you'd like to share it with Space.com and our news partners for a possible story or image gallery, please contact managing editor Tariq Malik at spacephotos@space.com.